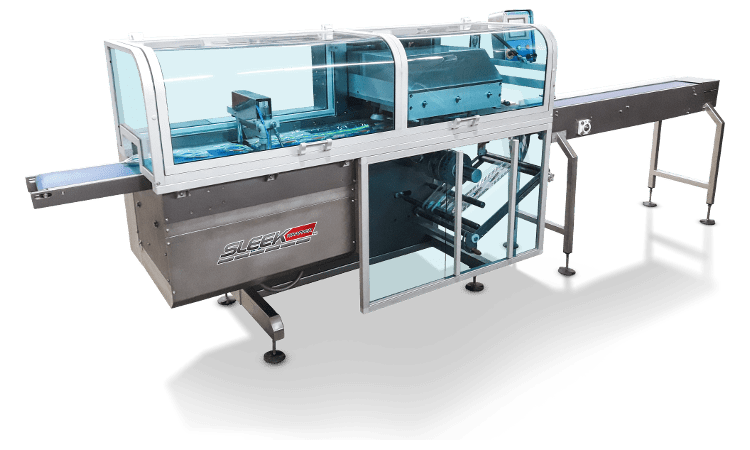 The high performance SleekWrapper Inverted servo driven horizontal flow wrapping machine designed with reliability, simplicity and serviceability to produce up to 100 packages per minute with a maximum web width of 19.6” or 500mm. The Sleek Inverted flow pack machine uses 5 servo motors that create quick and easy changeover and adjustment, reduces product and film waste during production and offers low maintenance costs. Servo drives assures precise positioning, smooth acceleration – deceleration. Ideal for soft or sticky products, multipacks, and other products that are difficult to push with the lug chain design found on conventional bottom seal flow wrappers. The film is fed from below the product. Hard to handle products are securely carried on top of the packaging film from the former through the cutting head.